RPA has passed its peaky hype and we're now staring into reality for the first time in 6 years. And it's a messy picture.... the market has largely bought into three software tools and tens of thousands of people have invested a significant amount of their time training themselves on them. However, beyond scripts and bots and dreams of digital workers scaling up rapidly to provide reams of value, most enterprises are fast coming to the realization that they need an actual process automation platform capability that ingests their data, visualizes it, machine learns it, contextualizes it and finally automates it. Essentially, the whole lifecycle of data components needs to be integrated into a single platform in order to take maximum advantage out of automating processes through scripts, bots and APIs. Having tracked the product for several years, and also researching the lions share of early adopters of automation products, AntWorks' machine vision is an outstanding product, and Fractal math has significant advantages over Bayesian. Visiting with the core team just last week, having them show how it can extract text from images within images is something that can provide a huge edge in the market as users wise up to what they really need to integrate data. One of their use cases involves taking a picture of a coupon flyer to find out intel on what products are being promoted, special packaging, size, flavors, dates of promo etc.. They can tell you, for example, how many ounces are on a Pringles can in an image on an image on an image (label on a can in coupon on a page of coupons). 1) Its platform offers up integrated intelligent automation – AntWork’s ANTstein platform consists of modular components including “cognitive machine reading (CMR)” sort of a computer vision meets machine learning-based smart OCR, RPA , and a smart analytics components. While these are available piecemeal, they are designed to work together. The primary client entry point today is with its CMR module. So rather than adding AI to RPA, AntWorks adds RPA to AI. HFS created our Triple-A Trifecta framework (eg: RPA, AI, and smart analytics) to make the point that you can start anywhere with intelligent automation, but our research shows most firms start with RPA and then can struggle with scale. Clients that start with CMR are tackling unstructured data which can then help unlock greater functionality with RPA downstream. ANTstein offers a path to integration which can enable end-to-end work flows and the potential for the coveted scaling of IA. AntWorks is launching its new version of ANTstein, Square, imminently. 2) Its machine learning engine leverages fractal data science rather than neural – While the sciences are different, why it matters to enterprises is that you can train some business process algorithms faster as there are finite sets of patterns and outcomes in many business processes. Fractal science tends to work best with a finite set of outcomes, rather than infinite, where neural would be more appropriate. 3) Innate process and verticalization depth – AntWorks’ leadership team came from the BPO industry (eg: Infosys BPO, WNS, Capita, Mphasis BPO), where deep understanding of business processes is essential. This deep process knowledge in the areas being automated by enterprises today is largely lacking from most AI and RPA software companies. AntWorks is applying this process focus to develop domain-specific use cases for horizontals like finance and accounting and HR and more notably industry-specific use cases like title search in mortgage or claims processing in insurance. The service provider community has really been bridging the gap between intelligent automation software and domain knowledge to create end-to-end workflows. AntWorks’ domain use cases bridge its full stack and demonstrate the potential of integrated IA. 4) RPA innovation – While AntWorks missed the first wave of RPA, it is working to offer RPA product improvements in areas clients are grappling with such as bot productivity to ensure its relevancy. Its forthcoming Square release of ANTstein is purported to enable dynamic reallocation of idle bots and multi-tenancy of multiple bots on one machine. One of their clients in attendance at the event indicated this would be a major resource saver. 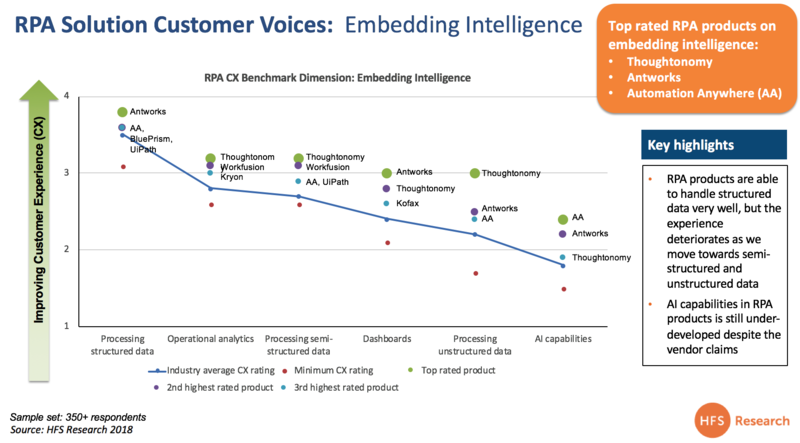 5) Bot cloning – As many enterprises have already invested in one or more of the leading RPA software players, AntWorks needs a value proposition beyond follow the leader RPA. An interesting concept they are working on is “bot cloning” – essentially replicating existing bots and porting them over to their platform. Given its current focus on unlocking unstructured data for enterprises as their lead selling point, this may create a logical bridge to RPA as long as it works. As enterprises increasingly focus on outcomes rather than the enabling technology, this may create some conversion opportunities as enterprises look for ease of integration to enable end-to-end workflows. Go global with its platform play. AntWorks, fuelled by funding and early client success, is making a major push to take its product to market globally. While its full stack platform offers enterprises a tangible path to integrated intelligent automation, the reality is that today they are best known for their cognitive machine reading capabilities. AntWorks needs to continue to focus on its domain expertise which has the greatest potential to showcase end-to-end workflows that work across its stack – essentially showing intelligent automation in action (the Triple-A Trifecta). Currently, there are a lot of piecemeal IA tools in the market that requires custom integration to tie them together to enable straight-through processing of automated workflows. As enterprises grow weary of having to continually piece together the components that enable intelligent automation, the focus on tools will become more about what delivers the best results and can scale. 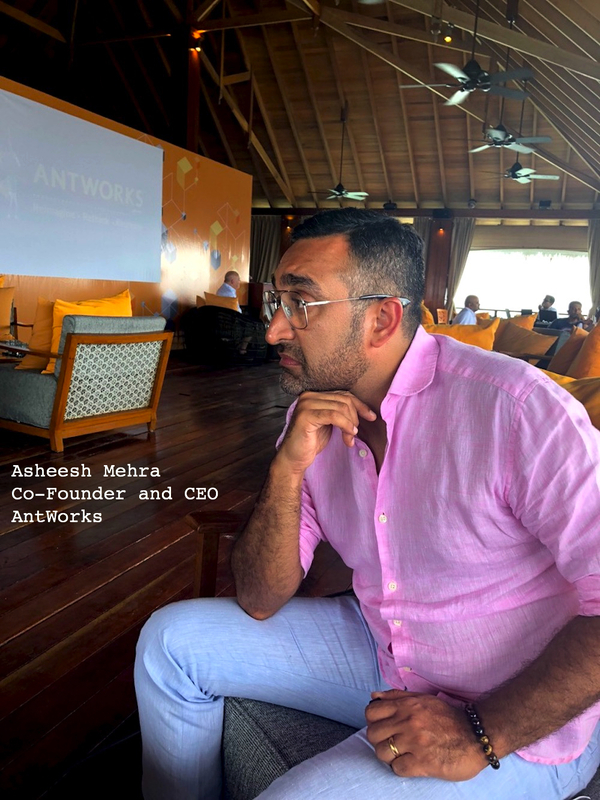 AntWorks’ investment in people and expanded geographic footprint will help take the message to a broader range of prospects outside its core client case in Asia Pacific. Additionally, the firm needs work on its global channel strategy. A solid network of partners, particularly strong service partners who understand the tech and value proposition, can help AntWorks reach a broader range of prospects. Secure more investment funds to fight for a limited supply of talent. What's needed next is a significant second round of funding, not dissimilar to those being ingested by UiPath, Automation Anywhere and more recently Blue Prism. The sales team, under the experienced leadership of Bill Schrank, need added firepower, and AntWorks needs to prove its RPA story aggressively... how can they truly bring it all together and negate the need for enterprises to purchase expensive RPA licenses when ANTstein provides it all for them in a one-stop solution? And finding the talent is tough as the Big 3 currently soak up any semi-decent professional with a pulse capable of understanding and communicating the value of integrated automation. Combat "RPA fatigue" to re-energize a weary and frustrated market. Too many enterprises have been oversold the same old story of no-code and the fact this is supposed to be "easy". So Ash and his crew need to make the case that clients of AA, BP and Ui can jump ship without losing face. In addition, weary service providers and advisors need to be convinced to put similar resources into AntWorks that they already have into the others.